Heavy Duty Digital Locks provide a service which secures the safety of exterior access points where a high level of security is necessary to protect premises of considerable value. 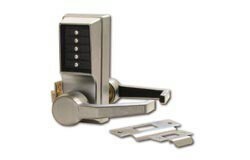 These locks can be used on garages, exterior doors, safes and also on any outbuildings. The locks come in a range of finishes including satin brass, bright brass, polished brass and satin chrome and include from brands 'Unican' and 'Simplex' and can be applied to doors between the widths of '35mm' to '75mm'. One model in this heavy duty range, 'Simplex 5000', aims to eliminate any problems and costs associated with collecting keys and cards by introducing the method of a single access code without the need of removing any keys from the lock.